When I talk about cross-country road trips, I’m talking about trips where the objective is to get from here to there in the shortest time, not the kind where you meander around the country looking for something to do. I know very little about this second type of trip, other than the people who do them piss me off with their speed (or lack thereof), and their seemingly carefree and clueless changes of direction. It’s like they don’t have a purpose or mission. Don’t they know that the sole purpose of a cross-country trip is to get there as soon as possible, unload, go racing, load back up, and drive home again? The length of time it takes to drive from one point to another is directly proportional to the variety of scenery along the way. To further expound, if one mile of scenery along the road looks just like the previous mile, then time expands (infinitely). 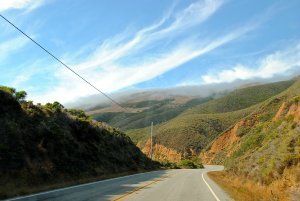 If one mile of scenery along the road looks entirely different from the previous mile, then time contracts. I suspect Einstein didn’t do a lot of cross-country driving trips, otherwise he wouldn’t have left this physics problem to me to discover. Yes, boredom does play a significant factor in my driving pleasure. My theory can also be stated as a mathematical formula: T = (D x B)/S, where T stands for the relative time it takes to drive from one point to another, D is the distance in miles, B is the level of boredom one feels, and S is the amount of scenery along the way. Would you be surprised if I told you that I came up with this theory, the name for it, the mathematical equation, and everything that goes with it while driving across Montana? Okay, no more math in this story, but Part 3 will be posted here next week.